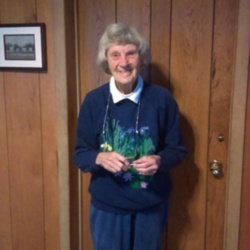 Ellen St. John is a staple member of the Cooperstown community. She was born in China in a rural area outside of Beijing in a community that consisted mainly of professors who worked at the local university, as her father did. She and her family moved to New York City in the 1940s and she has lived in the United States ever since. She studied nursing in a college that was connected with Columbia Presbyterian Hospital in New York City, which eventually led her to get a job at Mary Imogene Bassett Hospital in Cooperstown. Once she was in Cooperstown she became involved with a number of organizations; most important, she was a founding member of the food pantry in Cooperstown in 1977. Ms. St. John also discussed how she is involved with the weekly anti-war vigils that are held outside the Post Office in Cooperstown. This led her to further expand on some of her thoughts on the country today and some of the political issues that she believes are important in order to make the United States a great country that treats every person fairly regardless of economic status or race. She has lived in Cooperstown ever since she initially moved to the area with her late husband and four children, two of which were adopted from Asia. During transcribing I kept almost all of what Ms. St. John said, except for adding a few words and deleting others to make clear and concise sentences. She repeats words sometimes, usually for emphasis so I included those repeated words. This is the November 7th, 2016 interview of Ellen St. John by Allison Costantino for the Cooperstown Graduate Program's Research and Fieldwork course recorded in Cooperstown, New York. So Ellen, what was it like growing up in China? Well, I think it was a privilege for me because it was a very special place. It was a university, which was a Christian university, with people who cared about all the students. Almost all of them were Chinese and we had professors from very many countries, we had them from the United States and from Britain, from Australia, from Germany, from Russia, and many Chinese professors as well. It was a family oriented, small university so that we knew one another and it was like a village, each one taking care of everybody else so it was a very lovely, lovely place. I just feel that anybody who’s able to grow up in a different country is given a special boost in life because you learn to love other cultures, and when I came to the United States I felt I was Chinese so it was a very nice place to be. Well first my grandmother’s family grew up in China. They were teachers in Peking. Then when they had children, my mother grew up in China and then she too came back to China. It just so happened that my father came to teach at the university, he taught German and French met my mother and that was the beginning of my life. So have you gone back there since you initially moved here? I did not for many years but I and my husband adopted a Chinese daughter and a Korean son. When my daughter grew up she wanted to adopt children too and she adopted two Chinese daughters and I went over to China with her when she adopted the children, but I didn’t go to Peking I went to Shanghai and to Nanjing and Guangzhou so it was a different part of China but yet it was still China. When you went over there did you notice how the country had changed at all since you had been there before? Absolutely, what a change. When I grew up there we had hardly any automobiles in the city at all. When I went back to China the place was crowded with cars and buses and high-rise buildings and they were building more high towered buildings. It was just not like the Chinese city I knew when I grew up, which was just a place where you traveled by bicycle, walked, sometimes with a rickshaw, but almost never in an automobile. How would you compare life in China to life in America? Well it was very simple in China because it was a rural area even though it was just outside of Beijing and everything was slow. When I came back to the United States I came to New York and I was flabbergasted by being thrown into a subway and busy streets in New York. So it was quite different. And then, what made you want to leave China and move to New York? I came back to the United States with my family when dad was on furlough back in 1940, and the situation in the world was very tenuous at that time. The government would not let women and children return to China but they allowed my father to go back. The war broke out in 1941, so we didn’t know what had happened to him, but he was imprisoned by the Japanese with many other foreign people. Very luckily they allowed him to come back to the states by exchanging the American prisoners and the British prisoners with the Japanese nationals that were living in the United States. Each group was put on a ship and they met at the Cape of Good Hope in South Africa and docked side by side and they exchanged prisoners and that’s how my father got home again. Very fortunately he was not overly ill from lack of food some of them had, some of the prisoners had a difficult time but he was very lucky to have been moderately healthy when he got back. So during the time when your father was in this prison, how were you feeling, how was your family dealing with that? Well, we didn’t really know where he was because there was no communication at that time. We just had our fingers crossed that he somehow had survived and was living somewhere without too much pain. We just had to wait until we were told that he was being exchanged and just grateful that he was able to get back to us safely. What did you do while you were in New York City? Well, I was in high school when we first moved there. After high school I went to college and had a program that was connected to Columbia Presbyterian Hospital so that I went into nursing with a BS [bachelor of Science] degree. It was in 1945 that I went to school there and graduated in 1948. So, what made you want to go into that kind of nursing? I had wanted to be a nurse from the time I was a kid. A lot of people just don’t know what they want to do when they grow up and they test different types of things and finally decide what they want and sometimes they even change to some other occupation when they decide they don’t like what they chose first but I’d always wanted to be a nurse so it was very easy for me. It was such a wonderful school too. So, growing up during the war in New York City, what was the atmosphere usually like? Well I remember we had to have vouchers to get certain items of food for instance. Somethings you couldn’t get at all, but we didn’t suffer at all I think that we did not have a hard time. And how did you end up moving away from the city and to Cooperstown? Well it was in 1948 that [Mary Imogene] Bassett Hospital began to be affiliated with Columbia Presbyterian Hospital. They enticed people to leave New York and come up to Cooperstown and work here. I had just happened to come up with a bunch of nurses and began to work in Cooperstown. How did you feel like Cooperstown was different than the city at that time? It was so beautiful. I remember I came up on the train to Fort Plain and the hospital had a car that they sent to bring me back to Cooperstown. I came down that lake road and it was the most gorgeous October day. The place was just ablaze with dazzling colors along the lake and all reflected on the water it was the most beautiful, beautiful day. Of course Cooperstown is much more quiet and slow moving compared to New York City. I just loved it here, just loved it. Have you stayed in Cooperstown since you initially first moved here? I have been in Cooperstown for the rest of my life. What kind of things are you involved with in Cooperstown? I was very interested in some of the work that the church was doing. 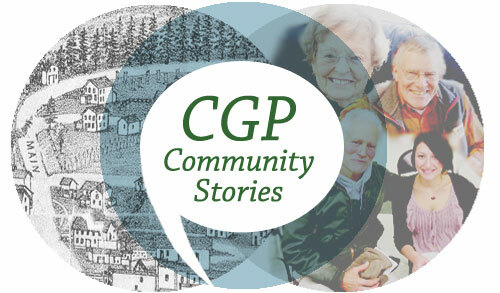 I was a member of the [First] Presbyterian Church [of Cooperstown] and became involved with some of the work they did. It was when my children began to go to school that I and a number of other Christian women started the food pantry. In the 1970s, it was a time when we hadn’t even thought about people being hungry in this well to do area. We didn’t even think about that. It was in 1977 when a group of us women were meeting for fellowship, one of the women told us that she had discovered a family that was unable to pay its bills, didn’t have enough money for food, the children were always sick and doing badly in school, so of course we just rushed home and packed up food from our own cupboards and took boxes to this family that was having such a hard time. We didn’t think that there was any hunger in this area, but around Cooperstown outside in the rural areas there are many people who are in difficulty. Once you open the door a crack, you begin to see what you hadn’t seen before. Soon another family came to our attention and we did the same thing, ran home, packed boxes of food to take to this other family and decided we really needed a place to store food in advance so that any other family that came to us we would have food already for them. We asked all the churches if they had space for us but the churches just didn’t have the space for us. But Bobbi Dystremsky was the director of the Red Cross and she heard of what we were looking for and she said “You can have a couple of my cupboards in the hallway in the basement of the library building. I’ll give them to you.” So that was the beginning of the food pantry that day. We stored as much food as we could, asked the churches for financial support and started out very slowly, very slowly and saw people in the basement of the library building. It was a bad place to be because it was a thoroughfare; there was a stairway, people going up and down people going back and forth in front of us, in front of the cupboards. It just was a bad place but we were there for many years because we had no other place to go. It was in, I can’t remember the exact year, but the Presbyterian Church allowed us a space in their church house basement. They had a room there and they allowed us to move the food pantry there. It was just wonderful because it gave us a more spacious area and we could store more food and we could have privacy above all. We could have privacy with the families and we could begin keeping records which helped us to know which way we should be going. We were very slow the first several years there but each year more families came and we grew inch by inch. The churches did support us financially and many of the organizations hearing about what we were doing began to support us as well. They gave us financial support and sometimes they bought food for us and sent food to us to put in the cupboards. It was about 1990 that we became an associate with the Feeding America program that was the national feeding program larger than any other program. They were known all over the country. They had a great huge warehouses and they were able to get food from grocery stores that no longer could keep certain or could not sell certain types of food whether the can was dented or whether the box was bent, or maybe some of the writing on it was smeared but the food itself was good. So they had a lot of food that they could store for the various small food pantries. We used to call ourselves the food bank, but they said don’t call yourself the food bank you’re a food pantry, so we changed our name to a food pantry. It was wonderful because we could get food more cheaply. They had USDA [United States Department of Agricuture] food there as well and we could order food about once a month and truck it to our food pantry. It was wonderful because we could buy some of the food for 16 cents a pound so our money went much farther doing that. But, some of it was bought almost like a grocery store so we did have some funding that we needed to send more to buy the food that we needed. They had everything you can imagine and we were just so fortunate. We belong to the food bank of Latham, New York, the regional food bank and this was close to Albany. The food bank was very, very careful with us they supervised to see that we had a food pantry that was well run and we did thing s that we needed to do. And thank goodness we had a community that was so very, very compassionate and caring. We could never have done what we’ve done without such a community. We have a staff of all volunteers that help us to see the families and give them the food and keep the records and there are substitutes that come in when those staff members couldn’t be there. We have people that came in once a month to help unload trucks and take them down into the basement and store the food. Sometimes we have ordered as much as 20,000 pounds of food in a month so it was a big job to do that. People would come and they would form lines and pass food downstairs and into the cupboards. It was a fun day for everybody, we’d enjoy that day when we brought food in. There were several companies that had bug trucks and they transported food for us freely because everything was volunteer about 96% of all the donations that came to us went right into feeding the people so about 4% that was used for bookkeeping or other small needs that we had. There were many volunteers across the town. The various clubs sent us money the firemen helped us, the Tops grocery store gave us turkeys at Thanksgiving time and they also had vouchers so that people could buy food without using their own money for eggs and for milk, and the Price Chopper was great because they allowed us to have all their day old bread so that gave us a big boost. Price Chopper since then have given us all the fresh vegetables that are outdated but still very good so the very expensive fresh foods were given to us for these people who couldn’t afford to buy fresh foods. So often when you’re unable to spend a lot of money on food, you buy the cheapest thing you can buy, lots of pasta, pasta, pasta, pasta. To have milk and eggs and sometimes meat and good vegetables something that they couldn’t afford that was a real boom for the food pantry. The Chobani Company that made yogurt in Edmeston sent us about 100 cases of yogurt free in a month and so we bought several refrigerators so that we could put yogurt away so we could have yogurt for all these people. Even the school was interested in what we were doing. One of the teachers wanted the kids to learn to be considerate of people who were poor and didn’t have enough. He had a contest from the teachers and the students in the high school to see who would get enough or the most flour, bags of flour for the food bank. That started the middle school beginning to think about what was happening and they decided they would too. In another part of the year they began collecting food for the food pantry and the elementary school didn’t want to be left behind. They were these cute kids, they decided that they would ask each class from kindergarten through 6th grade to choose a specific food like spaghetti or peanut butter or maybe cereal or maybe tuna fish and each class would choose one and try to get 100 cans or cases of this particular food and deliver it on the hundredth day of school. So it was a contest in a way but the children really were just wonderful; they would come and bring the food. It was an exciting day for everybody when they did that. We tried to give every member, every household that comes to us, five days worth of food, three meals each day. We try to give all nutritious food, we don’t like to give soda, we don’t like to give candy that kind of stuff but nutritious food for the children. There were probably twenty-one hundred households that came to us in the last couple of years, that many people; they are allowed to come to us approximately once a month but we’re very flexible because we’re not a government organization, we’re private and so we can when we feel it’s necessary to give certain families in great need more food than we might ordinarily do, but its interesting that and it was a surprise to us that about a third of the people who came to us would only come once a year. And it was probably due to some disaster that occurred, either the breadwinner of the family was sick, lost his job, or the car was in an accident and they had to buy a car and they had no money for food, or could be a divorce, it could be a number of things that would just throw them in the ditch so that they would have to ask for food. Would you like an interesting story? There was a single mother with two kids and she had worked and supported them all the years that she had them and suddenly she lost her job. It turned out that all her food was used and she had absolutely nothing left. She came to the food pantry, opened the door on the top of the stairway, shut it again and went home. She was just too embarrassed to come to ask for food, but the kids were crying that night because they didn’t have anything to eat for supper. And the next day she forced herself to come to us. Came all the way weeping, and we tried to comfort her in saying that she was exactly the kind of person we were set up to help. We wanted her to be there and not to feel bad and made her feel much more comfortable and gave her food and she came back in another two weeks, came back in another two weeks again, and then she found a job and she never came back again. But it’s such a wonderful feeling to be able to get people over a disaster like that and to get them back on their feet. I think that it’s a very heartwarming kind of work to do. I don’t think you’ll find anybody more friendly or more wonderful. If you want a friend, make a friend of one of the food bank workers, they are super-duper. We used to serve the entire county of Otsego, but then we increased the number of people who came to us. Over every year we saw more than the next and we just felt we couldn’t serve as many people and so we said we would serve the people in the northern two-thirds of the county and we left the bottom third, the southern third of the county left them to the four food pantries in Oneonta. That was a larger population so that they also had to work pretty hard for that smaller group but we served the northern two thirds of the county. We joined the backpack program through the regional food bank. It’s a program designed to help children who might not eat anything at all over the weekend only counting on the food at school in the weekdays. So there is a program where the children, the high school kids in the high school would come to the church and pack up backpacks for the children that the school had designated as very much in need. They would pack up all these backpacks, take them back to the school and hang them up on Thursday night in a special place, then on Friday the children who were really without enough food for the weekend would pick up their own backpack that they would recognize and take them home. It would give them five or six different child- proof foods, like cereals and soups and thing they could fix for themselves. So it was a really very fun thing for them to do and for us to do too. I think probably in it was in 2014 that they decided that going up and down those stairs was just more than we could tolerate anymore. With people going down to store food when the monthly food came from the trucks that was a big deal. Many of the people that came to us were either disabled or elderly and trekking up those steps with all these heavy bags of food was very, very difficult for them so we were blessed to have the church give us a place, a big, big room on the ground floor and so we moved there in 2014. At this time in 2016 this is the 39th year of the food pantry. We're 39 years old. So, with some of the families who would come in do you ever know what happened to them after they stopped coming to you? No, we don’t really know but we’re suspecting that they’re making it in some way or they would be back again. Because when they come they’re always welcomed they’re never made to feel guilty for asking for food when they need it. That’s the wonderful part of, I think, this food pantry. That’s the highlight for me that people felt welcomed and we began seeing some people every month and then we became almost like friends seeing each other. So, were there any ever difficult times where you think the food pantry might have been in trouble or maybe wouldn’t make it? So a little bit about the church. So you still go to the church now? And how do you feel the church has helped the community? I think that our church has been very socially active. Not only concerned with people who are hungry, but they’re concerned with what’s happening in the world as well. We try to support a number of missions. Let’s see, we have given donations to people who, I'm trying to think exactly how to describe it. There is a national [Presbyterian] church and we work through them to help people who are either refugees or people who are in war torn countries, or people who have children who have cleft palates and cleft lips and we’ve sent money to help them. We have become an LGBT church so that homosexuals are not laughed at and we accept them and they’re part of our community. Some of us have worked as peacemakers in the town. A group of us have vigiled for peace in front of the post office which is the one federal building in town, against war of any sort. Some of the Quaker women and men too joined with this group and some that are from different churches, some of them are from no church, one was a Catholic, there was a lady who’s been very active from the Unitarian church. So we started doing that way back, after 9/11 occurred. We felt even before the attack or the invasion of Iraq that something horrible might happen and so we started to work for peace even then. We’ve been there ever since, we’re there every week, every year, and its been 15 years now that we’ve been there. As you know we haven’t stopped all the wars, sadly, but at least we felt that we had to speak up and urge people to write their congress people, to write the president, to call them, and we still stay there because we feel it's imperative that we stop war. What made you interested in this specifically? In specifically the war you mean? I just think that the war is eating up precious money that could be going to healthcare, schools, helping people get jobs, help the environment, and help the infrastructure of our towns. Bridges are falling apart because we’re not taking care of them, sewers are coming apart because we're not taking care of them. The money that war uses is so misused and we could so much more benefit from helping people rather than going to war. It eats up all the good things in the world rather than helping to make people more brotherly and helping each other. What are the types of responses you’ve gotten in Cooperstown since doing these vigils outside the Post Office? Well, at first when we started vigiling it was a time when people were pretty well brainwashed by the government that war was necessary. We had many people who came and scoffed at us and called us unpatriotic. Some of them, there was one woman who actually spat on the sidewalk she was so angry that we weren’t doing what the government wanted us to do. It’s too bad that we think of patriotism as following everything the government tells you to do. We need to realize patriotism means trying to make your government your country as honorable and strong and friendly as any other country could be. To make it a peaceful country is, I think, patriotic. Occasionally people would come from across the street where the National Baseball Hall of Fame is, because in the summer time we have a lot of tourists, and sometimes from other countries. There was a Swedish family that came across the street to us because we carry signs and they said “What are you doing?” and we told them exactly what we were doing. “We didn’t know that anybody would do this in your country. We must go back to Sweden and tell them there, there are people that don’t like the war.” It was funny. But summertime the place is crowded; in the wintertime it’s only sparsely occupied because it’s pretty cold. So, are you seeing that these protests are becoming more popular now that it’s an election year? I don’t know that election year has anything to do with it at all. They have not talked about foreign policy, the nominees just avoid that subject, but I think that overall up to now the people have the general population has come to believe the war in Iraq was a terrible, terrible happening. They begin to see what we’ve been seeing all this time. We get more people that come and stop and say thank you and talk to us and tell us their feelings, so it’s a much more friendly atmosphere now than it used to be. We’re happy that, at least we feel that, the public realizes that we’ve done a very bad thing invading Iraq when Iraq had nothing to do with 9/11, nothing. Do you see any not divide, but anything between the older generation and the younger generation, any difference in interest? I don’t know, I haven’t really considered that really. Most of the people that see us are already adults because school is on or else if it’s summertime the kids are very often swimming or doing something for themselves. When a group comes along that are full of children, it’s the children who read our signs. The children will sometimes ask a question what we mean by this sign and that sign. So it’s interesting that young kids can be more interested in what we’re doing than the adults. Do you think there’s any specific reason for that? So, what do you think is one of the, most important or I guess why do you think it’s important to go out there week after week when you’re protesting in Cooperstown? I am so concerned with war making in our country that I can’t not go. I have to go. Even though many people see that it’s not doing anything for anybody, it hasn’t stopped the war. I can’t not speak out in a democracy. I don’t think were a democracy if we don’t speak for what we believe is right, work for what is right and not just hide out. Otherwise we become just an oligarchy where the people in power have all the say. We need to be able to speak up and influence other people in what we believe, or at least speak out and try to teach people what we’re saying. So, how do you feel about the current political atmosphere of the country today? I think it’s a discouraging kind of time for everybody. There’s a great deal of fear and I think the government is not unhappy about speaking or helping us be fearful. I think fearfulness makes you latch on to anything they say, “I’ll do whatever you say.” I think that’s a sad thing. We need to use our own brains. We need to learn what’s happening and read more and realize that this country is a wonderful country, but we have to make it so. We just have to be part of it if we’re a democracy. We have to speak out. This election time is still scary for a lot of people because not everybody likes either candidate right now and that’s difficult for everybody. I think we need to push away the fear and learn more and do whatever we can to work for a government that cares for the hungry, who cares for the downcast. A government that will give up on some of its weaponry, and especially the nuclear weapons. We just have to put them aside because they are such a danger. An accident could happen more so than somebody willfully touching a button. An accident could easily happen and I think in the past accidents have almost happened in a number of cases. So I think we just have to be outgoing in helping our Congress cut back on military weapons and to be more willing to raise minimum wage, to help the people who have been pushed down and not only support the ones who are wealthy. I think there is some progress in this area. I think we’ve seen a little bit of that, but I think we can see a lot more if we have enough people pushing to help the middle class and especially the very poor. How come you never got more involved with politics? It’s something you seem to be so passionate about. I don’t know. [Laughs] I don’t know, I just feel that everybody needs to do something to help this country become more honorable. We are the wealthiest country, as well as the most powerful, so that we need to speak up and be a noble country. How have you seen things in Cooperstown, not necessarily with these issues, but how do you see the people seem to care or they don’t seem to care about these issues going on? I can’t really say. The friends I have are very concerned, but I’m not sure everybody is. I’m not sure that everybody reads a great deal and listens to the programs that will teach us what you can’t even read in the newspaper. Very often the media doesn’t tell you all the things you should know. I have a program that I watch every day if I can it’s called Democracy Now on the internet. They are not supported by corporations and they can say freely whatever they feel is right and they have wonderful discussions on the internet to tell us what is happening that the newspapers don’t tell us. We learn a great deal more from a program like that. So I also am trying to read some books on racism because we really are in very sad state about mass incarceration right now and we need to cure that. We think that slavery is over, we elected a black president therefore its all over, but its not at all. We’re really hurting black people in terrible ways, so we have to stop that and that’s another of my pet efforts. What do you think could be done to stop that kind of stuff from happening? I think some of our laws need to be changed. Voting laws right now sometimes keep African Americans from voting or Latinos from voting and that’s just not right. We have to change our laws I think, on marijuana and not allow black people to be incarcerated for smoking marijuana. Some states allow it now, but I think it needs to be countrywide so that we don’t have that many people in prison, and mostly the black people are the ones who get incarcerated much more quickly than white people do. You just have to guard against oppressing people because of their color. Have you tried to teach your children these same values and how have you seen before the newer generations kind of picking up on these issues? Well, I have a daughter who is passionate about this as well. She lives in Cleveland, but she works as I do. I have a son who isn’t quite as interested and another daughter who is interested in some ways, but has been having a very difficult personal life and isn’t as outspoken. Then I have another son who doesn’t act interested at all. So you see it’s hard to know. We’re so different families are full of different people. But they all know what I feel. Where do you see the country going forward maybe in five or ten years or where would you like to see it? Five or ten years? What I would like to see is a reduction in armaments. Every time we send armaments to the Middle East, to Saudi Arabia, they bomb Yemen or they bomb Syria or they bomb some other place. I think that one of the most important things is to stop selling weapons to the Middle East or to Israel. I don’t know what our new president will do, but we who feel strongly about not going to war I think need to press our government more. I just hope that is one way. I’m hoping too that with the minimum wage going up, and I think it will, there’s enough pressure for that probably, that will lift up some of the people who are struggling now. Hopefully they will tax the wealthiest people more than they have been. I hope they will pay part of their citizens. Do you foresee yourself doing this kind of work until however long you can? As long as I can. I do hope to. Here in Cooperstown how would you describe, I guess, the political climate or how have you seen things obviously since Election Day is tomorrow have you seen people becoming active in politics? I don’t really know what to say. They may feel that they need to speak out more. I think a great deal of it depends also on our legislators. It's not only the president, the president can’t do everything he wants to do if the senators or the representatives refuse to do what he would like. It's very difficult sometimes but that’s part of the blessing of this country that we can have one oversee the other so that it’s not just one person deciding what we need to do. If you had to leave, let’s say one piece of advice for people like my age, or the younger generations what would you say to them? I think the younger generation, your generation is to be highly praised. I think that you all have been more progressive than some of us older folk. I think you are pretty well educated compared to years ago. I think that you’re gonna take hold even though I'd like to leave you a better world and not put all the burden on you, that’s not fair. But I think that younger people are more progressive and are perhaps better educated. I have high hopes for younger people I think that we’re leaving the country in good hands although with difficult problems to work out. How do you like living in this village, do you feel like it’s given you kinds of opportunities that you might not have had otherwise? I think Cooperstown is a pretty well educated town. They are friendly and they’re pretty open. I think they’re open enough so that we’re able to do some of the things that we’ve done that maybe are not possible in other towns. I think that it’s a very caring town. I'm really so grateful to have lived here. Not only the beauty and the friendliness of the people here, but I think you can see what doesn’t happen in every town. The farmers market is here and we see people worried about the environment trying to change some of the ways we act so that we don’t harm the environment. Some of us are supporting the Standing Rock Sioux tribe Indians. So I see a lot of hope with people that are trying to help others that are in great need or need help. The environment is not only for them, but for us too, we have to be really careful and I know our church members have helped stopped the fracking in New York State and I’m really glad that that had happened. Thank you so much. It was a pleasure to talk to you. Thank you so much, Allison. I’ve been so happy to meet you and talk with you too. 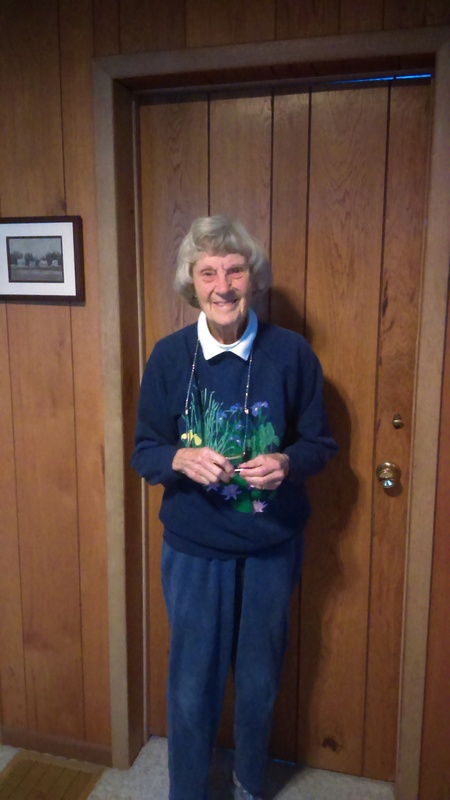 Allison Costantino, “Ellen St. John, November 7, 2016,” CGP Community Stories, accessed April 25, 2019, http://cgpcommunitystories.org/items/show/265.